Flexible two component gray waterproofing mortar for special applications. 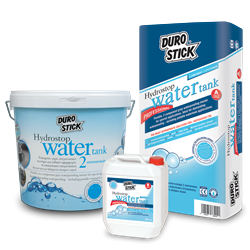 Ideal for demanding waterproofings - including potable watertank applications. Flexible non-toxic waterproofing mortar for demanding applications. Its application to potable water tanks maintains the quality and sanitization of fresh, potable water, as it is certified for that purpose by the State General Chemical Laboratory of Greece (Ref:00178/015/000). Its applications are not limited to storage tanks for potable water. • The product is successfully applied for sealing applications on surfaces made of concrete, brick and plaster, cement screed, stone etc. • Suitable for crack repairs around slates and floor slabs. • It is also applied on surfaces with high water repellency requirements such as underground structures, foundations, tunnels and wet floors as well as structures that are subjected to high hydrostatic pressures (positive or negative), such as basements (exterior application, before backfilling and ‘therapeutically’ in the interior). • It is recommended for use on sloped roofs made of concrete, before installing clay roofing tiles. • It is applied on bridges and residential or athletic swimming pools etc. • It is also recommended for the ultimate roof waterproofing by protecting lightweight screeds, as part of thermal insulation systems, and generally for the waterproofing of any mineral surface exposed to temporary or permanent moisture. • An additional use of the product is the effective sealing and waterproofing of areas to be planted, such as planters, rooftop gardens etc. • Exceptional for inverted roof insulation systems, before the installation of the insulation boards of choice. • It is the necessary component and part of the perimeter insulation, at ground level (sealing zone), when installing the External Thermal Insulation Composite System, THERMOSEAL of DUROSTICK, on wall surfaces close to or touching the ground. Counters positive and negative pressures, up to 7 atm. per DIN 1048. Certified as product for surface protection of concrete surfaces (c) per EN 1504-2.